Eddie Burns and Glenn Heights Fire Department staffers dedicates new ambulance. 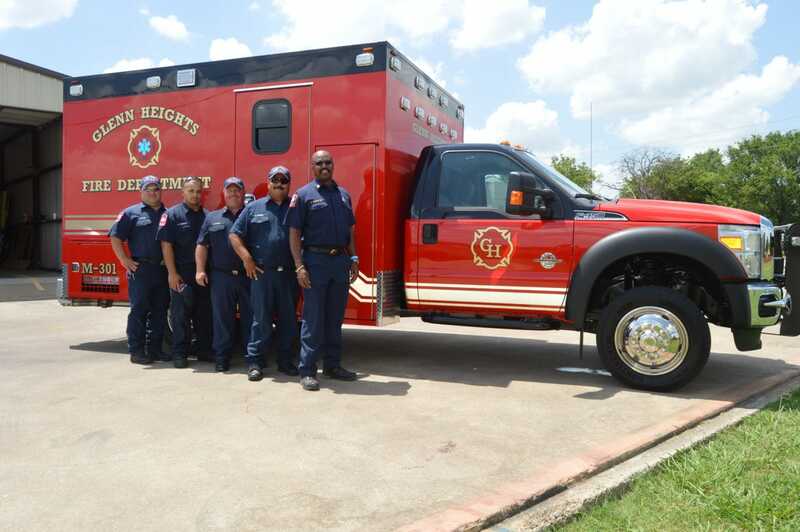 GLENN HEIGHTS—Children often have dreams of becoming a firefighter. The Glenn Heights Fire Department is giving local kids a chance to see if that dream could become a reality. Beginning January 9, 2017 the Glenn Heights Fire Department will begin a Youth Fire Academy. Burns said he also ran a high school Fire Academy at Eastern Hills High School in Fort Worth. “This Fire Academy is a way to introduce the students to a career in the fire and emergency medical services,” he added. Partnering with the current afterschool program, students from East Middle, West Middle and McCowan Middle School are invited. The 16-week program will include not only Burns, but also additional fire personnel and guest presenters. Students can expect to experience firsthand the duties and responsibilities of a firefighter. Students will also learn about the tradition of public safety and giving back to the community in this way. Graduation from the Youth Fire Academy will take place in May 2017. At the end of the program, students will know how to use firefighting gear and equipment. Academy grads will understand technical rescue and hazardous materials while also having undergone hands-on training. Finally, at graduation the students will be given a burn house exercise and a rescue scenario. McCowan Middle School in Glenn Heights will play host to the first Youth Fire Academy.